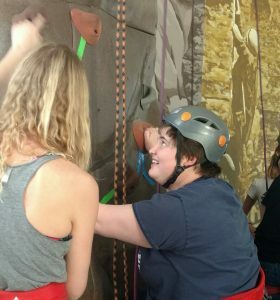 The NSCD climbing program has something for everyone at every ability level. Our staff provides a peak therapeutic experience while passing along the skills instrumental to being a successful climber. Staff performs an on-site assessment that complements the participant information provided prior to arrival and designs a custom curriculum in one of our three learning tracks. You can climb year-round with the NSCD and no experience is necessary. We climb outside in the spring, summer and fall, then move indoors for winter classes. Sign up for the NSCD Climbing Club or design your own custom experience. Friends and family are welcome. All equipment and adaptations are provided. Participants must be independent and manage self-care or bring a care-giver to provide assistance. 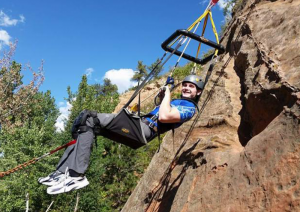 During the Indoor Rock Climbing Program with the NSCD, athletes will learn the basic skills of indoor rock climbing from a certified American Mountain Guide Association Single Pitch Instructor. Those skills will include but are not limited to: tying figure eight follow through knot, belaying using an ATC device, rappelling using an ATC device, climbing technique/movement and climbing history/ethics. This is an all-inclusive program for all ages, abilities and skill levels. We will provide the adaptations and assistance necessary to help all athletes overcome their own personal challenges. We know that through rock climbing you can meet and overcome obstacles you never thought possible! 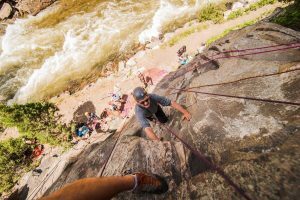 During our Outdoor Climbing Club sessions, you will climb high above the valley floor of Colorado’s iconic Clear Creek Canyon. In this outdoor climbing experience, you will learn the basics of outdoor climbing from tying your own figure-eight follow-through knot, belaying/rappelling, climbing technique, equipment selection/maintenance and much more. Throughout the session, you will receive high-quality climbing instruction from an American Mountain Guide Association (AMGA) Single Pitch Certified Instructor and learn the skills and techniques necessary to stay safe and progress in the world of rock climbing. You will receive specialized one-on-one instruction of the highest caliber and explore new and beautiful climbing areas in the Front Range. We hope to see you out there on belay, and we can’t wait to climb on! Click BOOK NOW button below to view future climbing dates. *Link to register will only be active during the climbing season. * You must register for these climbs by 3:00 p.m. on Thursday before each climb, using the link below, in order to participate. If the minimum number of participants are not registered by 3:00 p.m. on Thursday before the climb then the climb will be canceled. All climbs are weather permitting and if there is inclement weather the program may be canceled for the safety of participants and staff. If you have registered for a climb and it is canceled due to a lack of participants or inclement weather an NSCD staff member will contact you as soon as possible to inform you.